Hematuria is one of the most common presentations in the Urology clinic. Visible hematuria is an indication for detailed evaluation. Most cases of hematuria can be diagnosed by urinalysis, urine culture, urinary cytology, computed tomography, and rigid and flexible cysto-ureteroscopy. However, some cases are challenging and, rarely, can go undiagnosed. We present a rare cause of hematuria that was challenging both to diagnose and to treat. A 50-year-old woman presented with a 1-month history of painless gross hematuria without clots. She had no history of loss of weight or appetite. She was a known diabetic, hypertensive and ischemic heart disease patient and on regular treatment but not on any anticoagulants. On examination, she was hemodynamically stable. Abdominal examination was unremarkable. Full blood count showed hemoglobin to be 10.6 g/dL. Urinalysis revealed significant hematuria. Bleeding time, clotting time, liver function tests, urine culture and urine cytology were unremarkable. Ultrasound and contrast CT KUB showed no calculus or mass lesions. Cystoscopy with retrograde pyelogram revealed efflux of blood from the right ureteric orifice and a filling defect in the renal pelvis [Figure 1]. Biopsy of the floating brownish lesion with attachment to the renal pelvis using a semi-rigid ureteroscope was reported as fibrocollagenous material with no evidence of malignancy. However, the semi-rigid ureterorenoscope was unable to definitively rule out malignancy and flexible ureteroscope was planned. The patient continued to have hematuria and received eight units of packed red blood cells and eight units of fresh frozen plasma. She underwent super selective renal angiogram that was normal. However, she developed swelling and ecchymosis at the right thigh (puncture site), which was confirmed to be a pseudoaneurysm in the duplex scan. She also started developing ecchymotic patches around the intravenous puncture sites. During anamnesis, it was revealed that the patient had bruises 2 weeks ago following insulin injection. At this juncture, her activated partial thromboplastin time (APTT) was raised but D dimer, fibrinogen and fibrin degradation product were normal. A PTT correction study revealed coagulation inhibitor syndrome. The most common inhibitor lupus anticoagulant was negative. The Bethesda test confirmed acquired factor VIII inhibitor syndrome with a value of 1.6 Bethesda Unit. 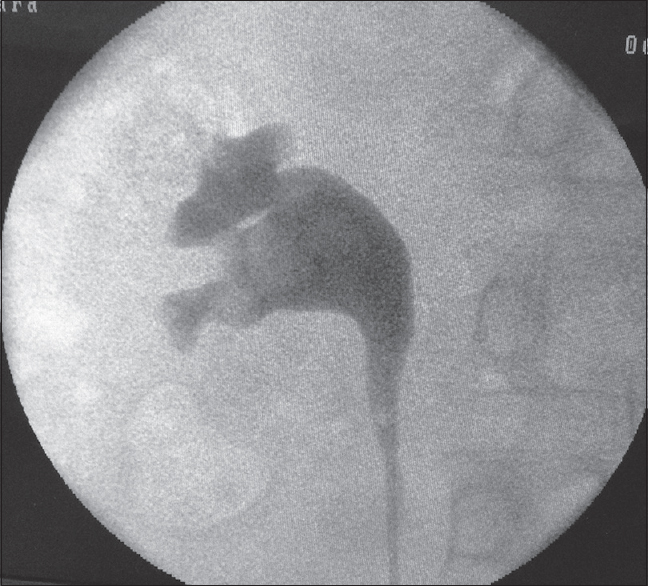 Flexible ureteroscopy showed hyperemic patches and brownish floating material in the right renal pelvis that was completely removed using a Dormia basket. This was confirmed to be blood clots on histology. The patient was subsequently managed jointly with a hematologist and treated with prednisolone and Factor VIII inhibitor bypass activity (FEIBA), and hematuria settled. Acquired hemophilia is associated with autoimmune disorders, malignancy (solid, lymphoproliferative), skin diseases (pemphigus, epidermolysisbullosa), infections, drugs and post-partum state, but these are mostly idiopathic. , The diagnosis is based on isolated prolongation of activated partial thromboplastin time not corrected by PTT correction study and confirmation by Nijmegen modification of the Bethesda assay showing reduced factor VIII levels with evidence of factor VIII inhibitor activity. The possibility of acquired hemophilia should be considered if elderly individuals present with severe hematuria, isolated APTT elevation, and when all other urological investigations were not contributory. This case is presented in view of the rarity of acquired factor VIII inhibitor syndrome, with only hematuria as the main symptom mimicking urological malignancy. Hay CR. Acquired haemophilia. BaillieresClinHaematol 1998;11:287-303. Green D, Lechner K. A survey of 215 non-hemophilic patients with inhibitors to Factor VIII. ThrombHaemost1981;45:200-3. MorrisonAE, Ludlam CA, Kessler C. Use of porcine factor VIII in the treatment of patients with acquired hemophilia. Blood1993;81:1513-20. Sallah S. Treatment of acquired haemophilia with factor eight inhibitor bypassing activity. Haemophilia2004;10:169-73. Collins PW. Treatment of acquired hemophilia A. J ThrombHaemost 2007;5:893-900.